ECARS merchandise shown below is available directly from ECARS or from outside vendors. Merchandise available directly from ECARS is sold at cost plus shipping charges. Thus, ECARS derives no monetary benefit from the sale of the merchandise it supplies. Furthermore, ECARS receives no monetary benefit from the sale of ECARS merchandise by outside vendors. ECARS offers information on merchandise from outside vendors but cannot assume responsibility or liability for goods or services offered by vendors. Returns of merchandise to vendors are subject to the vendors' respective sales and return policies. Please inquire of vendors as to their policies. Images do not depict merchandise in actual sizes or dimensions, which are approximate if stated. All prices United States funds (USD). Prices subject to change without notice. A JPG image of the ECARS logo may be downloaded here. ECARS Coffee Mug: $13.50 + s&h. ECARS mugs are available from The Sign Man of Baton Rouge for $13.50 + s&h each, which includes the cost of shipping via priority mail. You may include your call sign and ECARS number below the insignia on both sides of the mug, or have your call sign appear below the ECARS insignia on one side and your ECARS number on the other (or other variations). You may also specify mug handle orientation. See below to download an ECARS logo image for use on the mug. Note: Actual s&h cost to your destination will be provided by an order acknowledgement e-mail that you will receive after your order has been delivered and reviewed by The SignMan. Newport News, VA 23606 Name Badge $11.50 + s&h. Many types of Name badges are available from The Sign Man of Baton Rouge. See below to download an ECARS logo image for use on the name badge. 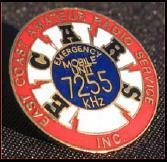 The ECARS insignia is a trademark of the East Coast Amateur Radio Service, Inc. The availability of merchandise bearing the ECARS trademark should not be construed as a waiver by ECARS of any rights in the mark. 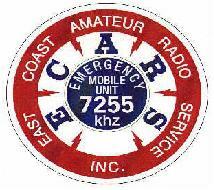 Copyright © 2005 East Coast Amateur Radio Service, Inc. All rights reserved.